Aluminium is the latest material to be used by padlock manufacturers since the price of brass has increase hugely in the last 5 years. Aluminium has always been regarded as a light and soft metal but when extruded from a solid block it is actually a very strong material with highly weatherproof properties. Don't be put off by the weight of an aluminium padlock, they are often much stronger than their heavier counterparts. 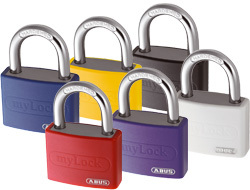 These vinyl coated padlocks are both light and secure with a hardened saw resistant shackle and a double bolted mechanism. 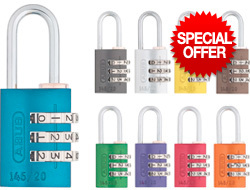 Available in 6 colours and a plastic coat that allows you write on the lock using a permanent marker.